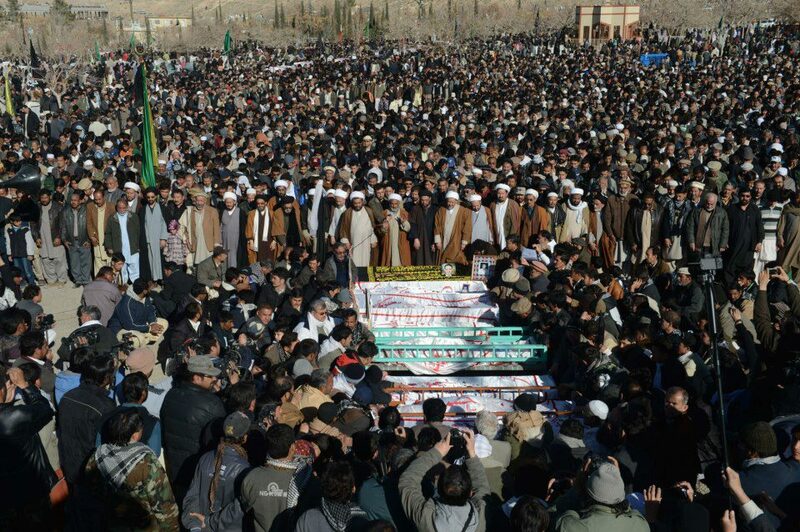 Martyrs of the Shia community in Quetta are finally buried after a 4 day protest ended. Something incredible has happened – a revolution in Quetta. But this was no ordinary revolution; no shots rang out, no buildings were stormed and no burning barricades blocked the streets. 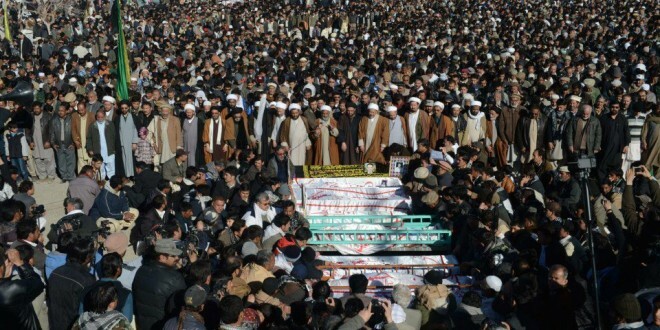 In sharp contrast to the violence and bloodshed that precipitated this crisis, the provincial government of Baluchistan – which had failed so utterly in its duties both before and after last week’s bombings – was laid low by the overwhelming moral force of peaceful, dignified and determined protest. Demonstrators braved the cold and the dark, steadfastly refusing to bury their loved ones or return to their homes until something was done. Yes, this was no ordinary revolution and these were no ordinary revolutionaries. For four days and nights this quiet battle raged, not just in Baluchistan, but all over the world. Shi’a and Sunni, Pakistani and non-Pakistani, came together in solidarity with the oppressed. Here in London, we gathered by the hundreds and – though separated by vast distances – our hearts were one with the people of Quetta. Outside government buildings and embassies we sat, chanting by day and holding solemn candlelit vigils by night, armed only with the determination that so many lives should not have been given in vain. No one expected us to win but, against all odds, we did. The government of Pakistan was shamed into action; they promptly dissolved the provincial government and promised an effective response to the crisis. This was not just a victory for the people of Quetta, or even for all of us who joined the demonstrations, but for the teachings of the Ahl al-Bayt (as) that inspired us to take action. When we were confronted by hatred and violence, we responded with dignity and restraint. When faced with indifference and apathy, we triumphed through our stubborn refusal to lose hope. This, in itself, is a victory over the terrorists who carried out the massacre. For while they rely on fear and violence to further their cause, we have shown we need only depend on the righteousness of our cause. There is nothing they want more than for us to respond with violence; this will almost certainly spark a sectarian conflict that will engulf Pakistan. But our demonstrations have sent them a clear message: that they may take our lives, they can never take the love of truth and justice that burns in our hearts. Our protests may have ended for now, but this must not spell the end of our efforts. We may have won this battle but the war carries on. Quetta was only the most recent in a string of bloody atrocities perpetrated against the Shi’a of Pakistan. These are not isolated incidents but part of an organized campaign of persecution and violence which stretches back for decades. Moreover, the success of this campaign in inflicting terrible casualties upon its victims can only be attributed to widespread and systemic failings on the part of the Pakistani government and security services. It is these root causes that we must address if we truly desire justice for the victims in Quetta. The dedication of the protesters who spent many days braving the cold was nothing less than heroic, but that same dedication is still needed to ensure that terrible crimes such as these never be repeated. 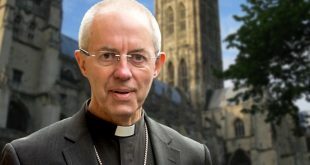 Here in Britain, and in the West in general, our response to these attacks cannot be limited to demonstrations and impassioned cries every time a bomb goes off; we need to maintain pressure on the Pakistani government to take action against the militant groups responsible, cutting off their access to funds and arms, arresting their members and putting them on trial for their crimes. It is only through decisive action such as this that we can hope to end the violence. Moreover, it is essential that we see Quetta as part of the greater global struggle against oppression, in particular the oppression of our Shi’a brothers and sisters which is so widespread. Whether it takes place in Bahrain, Pakistan or Indonesia, we must stand as one. 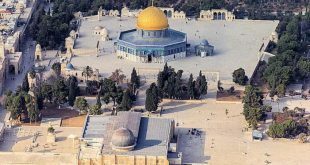 Those who persecute us, while geographically diverse, share a common ideology – namely that we are not true Muslims and therefore must be supressed, with violence if necessary. But we too have a common ideology; an ideology that proclaims the sanctity of freedom, justice and dignity for all, and which demands we stand united against evil. We can ill afford to highlight divisions between ourselves when our enemies make no such distinction. This means we must work together. If there has been anything positive to come out of the tragedies that have unfolded of late, it is that brothers and sisters from all backgrounds have come together for a common goal. And while there is still much progress to be made, we cannot expect to erase our differences overnight. Rather than assigning blame to those who – in our eyes – failed to show enough support at a time of crisis, we should look for constructive ways to break down the barriers between our communities in times of normalcy. We must also set up an umbrella organization to monitor the persecution of Shi’as all over the world and to help facilitate our collective response to crises such as Quetta. Involving sympathetic non-Shi’as with our plight is essential. It was heartening to see the complete absence of sectarianism in our response to these attacks as well as the many Sunni brothers and sisters who attended the protests, and the many more that were vocal in their denunciations of the atrocities. In Britain, we need to cultivate relationships with non-sectarian Sunni personalities and organizations, so that we can call on their support in times such as these. One of the main objectives of the extremists who carry out these attacks is to sow the seeds of division and animosity. Therefore, it stands to reason that we can inflict a crushing defeat on them by standing united against all forms of sectarian hatred. We must also strive to involve non-Muslims – in particular the media and human rights organizations. 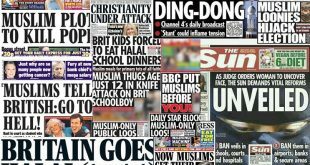 The Quetta attacks received better-than-usual coverage in the mainstream British media. We should not underestimate the importance of such coverage in raising awareness and putting pressure on the government of Pakistan (or any other nation, for that matter) to act. Lobbying our elected politicians is also critical if we are to bring diplomatic pressure to bear; we must write letters, sign petitions and demand that they raise the issue in Parliament – as a nation so visibly committed to Human Rights and with such strong historic connections to countries such as Pakistan and Bahrain, the British government has a moral duty to support our cause. It is our duty to enforce it. Let us make no mistake, our enemies wish nothing less than our annihilation. How could they not, when we represent such a terrible threat to everything they stand for? We are the living proof of an alternative to their twisted, hate-filled worldview. Every Muharram, we renew our pledge to uphold justice and resist tyranny, wherever they may, whatever the cost, as personified in sacrifice of Imam Husayn (as). By contrast, they perpetuate the values of Yazid; violence, hatred and intolerance. The need for action has never been more urgent than it is now. The events of the last few days have shown us what we can achieve through peaceful popular pressure and it is essential that we capitalize upon our success. If we are truly committed to preventing another massacre like Quetta, then burying the bodies of our martyrs is not the end of our struggle – it is only the beginning. 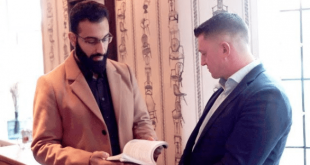 Who Needs Enemies When the Ummah Has Friends Like Muhammad Tawhidi?